The Kobe Club (神戸外人クラブ), an elite club for foreign residents in Kobe, Hyogo Prefecture. The club was launched in 1890 (Meiji 23) and located in what is now Higashi Yuenchi Park. The organization still exists today and is located in Kitano-cho. The building on this photo was designed by British architect Alexander Nelson Hansell (1857-1940, アレクサンダー・ネルソン・ハンセル). 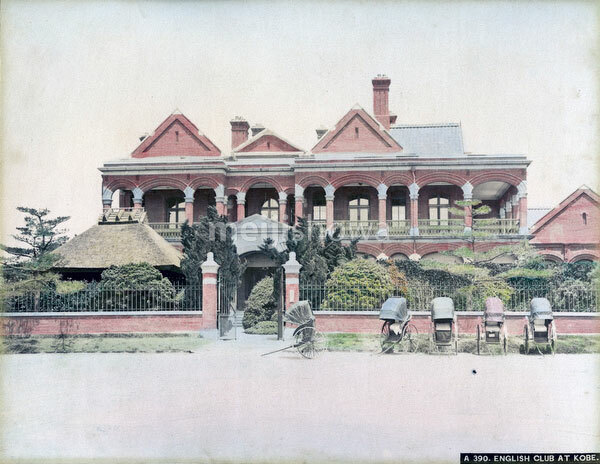 During his 30 years in Kobe, Hansell designed many of the city’s Western-style houses and buildings.